Almost 70 years ago, the outbreak of World War II forced the Irish Government to declare a state of national emergency. The Emergency Powers Act of September 1939 gave it the authority "to make provisions for the maintenance of public order and for the provision and control of supplies and services essential to the life of the community." Today a similar attitude is needed to address an emergency of a different and even more compelling kind: global economic collapse, combined with crises in climate change, water and energy supply, soil erosion, and the massive over-exploitation of natural resources. The extraordinary growth in population, wealth, urbanisation and societal complexity witnessed since the Industrial Revolution cannot continue. Nature's life-support systems are failing fast. Humanity is facing what might be called "The New Emergency." If ours is to be a stable world, the restoration of resilience at a local and global level must become a priority. And this resilience has to be achieved with the commitment and pace that countries adopt when, as in 1939, there is an immediate and very real threat to people's security and well-being. 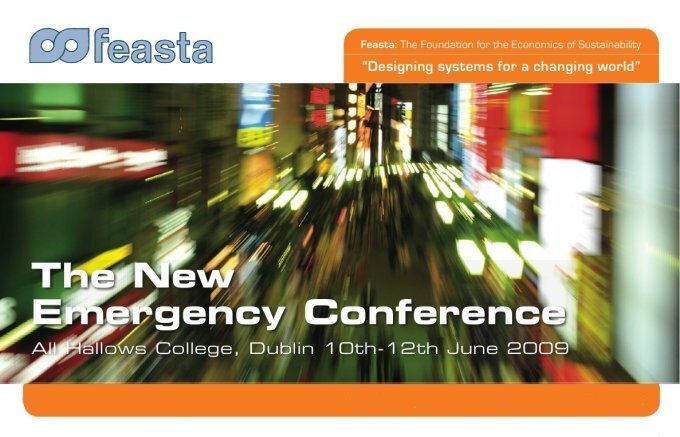 This conference, marking Feasta's tenth anniversary, analysed the systems and the mindsets that have steered the world onto its grotesquely unsustainable current path. Discussions focussed on the new systems (financial, energy, food) and ways of thinking that are urgently required to correct the situation and bring about a rapid transition to a more secure future. Many of the ideas explored were Feasta's. Others were presented by international speakers who broadly share Feasta's analysis of what needs to be done to build a truly sustainable world. Eamon Ryan, Minister for Communications, Energy and Natural Resources, launched the conference with an opening speech. Dmitry Orlov, author of Reinventing Collapse, gave a public lecture at the Davenport Hotel, June 9th and featured throughout the conference with a focus on deglobalisation, relocalisation and definancialisation. Chris Vernon, an editor of The Oil Drum, an energy futures discussion website, discussed how much usable energy the world can expect to get from fossil fuels in future since it is taking more and more energy to produce energy. Julian Darley, author of High Noon for Natural Gas, examined the factors involved in high-level decision making for sustainable change. David Korowicz, Physicist, gave a systems view of collapse dynamics. Dan Sullivan, director of Saving Communities, investigated land value taxation as a community development tool. Emer O'Siochru, Co-Founder of Feasta and EOS Architects, discussed the Proximity Principle in rural planning and urban settlements, integrating energy, heat, material sources, waste management and fertility. Ludwig Schuster, Living City Architects, concentrated on bio-regional currencies that encourage sustainable use of resources rather than requiring growth and exploitation. Bruce Darrell, co-founder of Dublin Food Growing, explored methods to develop secure food systems that do not rely on finite resources. Multimedia recordings of all the presentations from this conference are now available for free download from the Feasta vimeo site. You can also access these from the programme page (see below).